For many of us, the office is where we spend most our week. A home from home where, as well as working, we eat, drink, chat with friends, catch up on the news and even fit in a bit of online shopping. 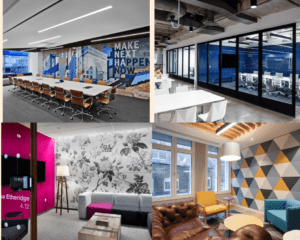 It’s little wonder then that many companies are now taking inspiration from home interiors when it comes to designing their office spaces. There’s more to it than a coat of paint and the odd pot plant though. By creating a more pleasant work environment, studies have shown that employees are happier, healthier and more productive. It’s also easier to attract and retain the best talent, which can help boost the bottom line. So what can we learn from our homes? Homes are divided into distinct spaces – a kitchen for preparing and eating meals, a bedroom for resting, a living room for relaxing and socialising, and so on. So why should an office be any different? During the course of a day, you’re likely to need somewhere to work, somewhere to meet and talk to colleagues and somewhere to eat. 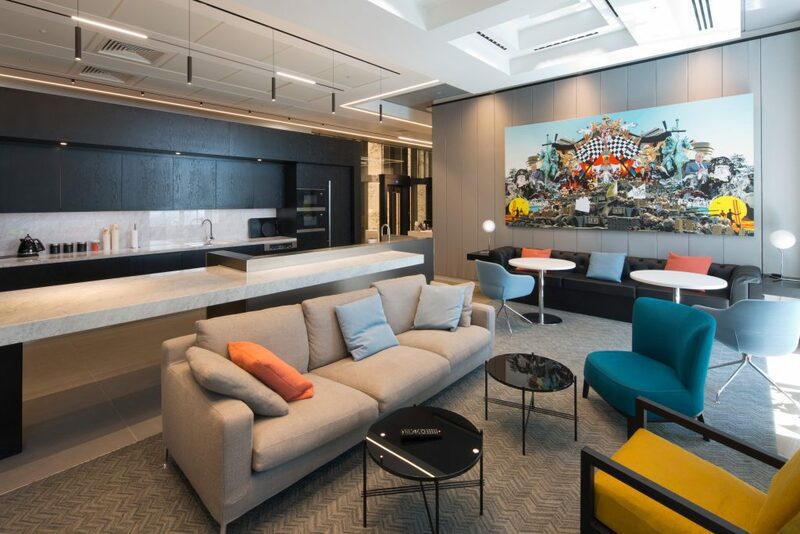 That’s why more and more companies are introducing greater variety within their office spaces. 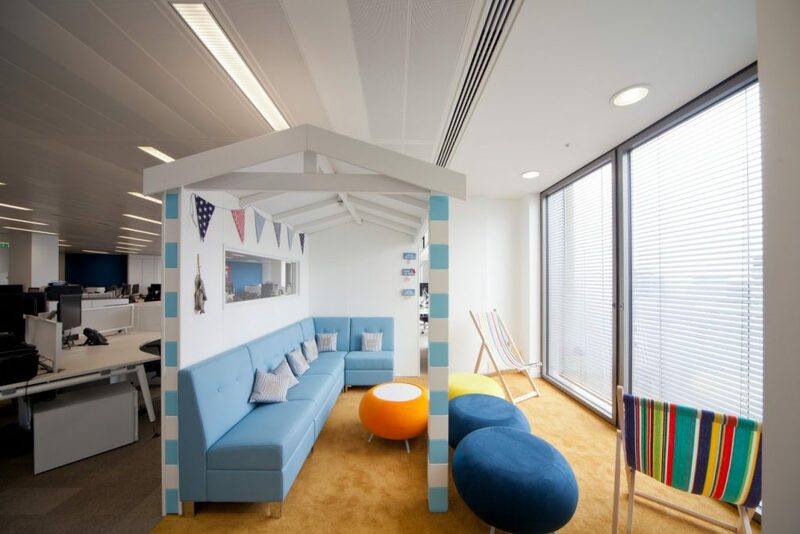 Think breakout areas for a quick catch-up, work pods for peace and quiet, separate kitchens for more sociable lunches and even deckchairs and beach huts to inspire creativity. 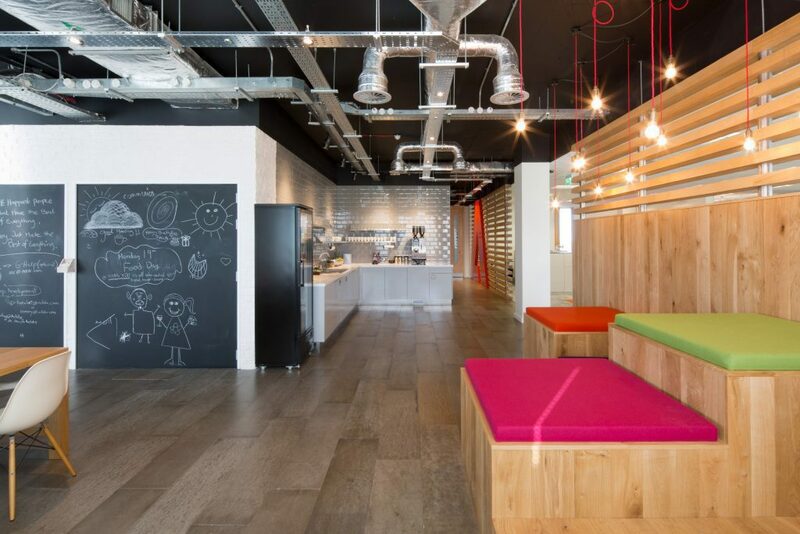 To give the Adobe team in Dublin plenty of choice when it came to where they worked, we made space for comfy sofas, set up work pods and created a mix of cosy booths and communal tables in the kitchen area. As well as being a place to make tea and eat lunch, the kitchen is a crossroads for chance encounters. After all, where else is an intern likely to bump into a director? A throwaway comment or a quick chat could lead to all kinds of ideas and innovations. Along with fridges, microwaves and seating areas, many companies are now laying on everything from fruit baskets and breakfast cereals to pastries and upmarket coffee. As well as rewarding the early risers, this also draws people to the kitchen to build social bonds and collaborate in a more relaxed setting. Just as in the home, each area needs fixtures, fittings and furniture, while colours and textures help create the right mood. Cosy, cushion-covered sofas are great for informal one-to-ones, but might prove a little too comfy and soporific for long, group sessions. 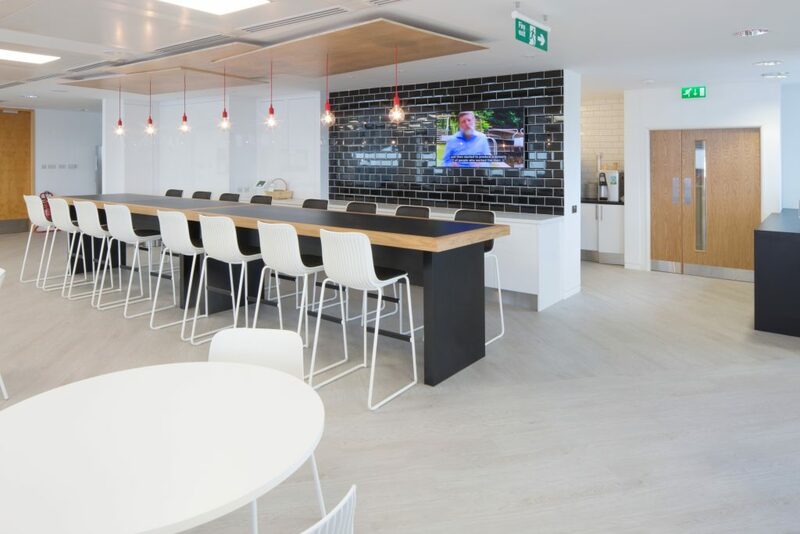 A sleek breakfast bar with high stools can work well for team meetings but someone in search of silence and focus might prefer a more practical work pod with an ergonomic seat and a desk. By mixing and matching colours, textures and styles, staff can instinctively realise what each unique space is designed to do. No-one would ever dream of living in a house without windows, so it’s curious that we’ve all settled for so long for working in offices that are either gloomy and grey or flooded with fluorescent light. Access to natural light is key and planning your office layout to ensure your staff get as much natural light as possible is a wise decision. Having furniture and other items block natural light is a real shame and should be avoided. Where windows are limited or in large open-plan areas, a simple switch to daylight bulbs can make all the difference, reducing fatigue and eye strain while improving alertness and mood. What could be homelier than bringing the kids to work with you? As more and more companies in the US offer on-site childcare, larger organisations are beginning to introduce crèches for their UK employees. It might be a while before it catches on fully, but look out for nurseries and playrooms popping up in an office near you. The workplace is evolving with staff now expecting the same level of comfort at work as they do at home so the challenge for companies will be to create a working environment that balances productivity, engagement and these home comforts. Want to talk about creating an amazing new workplace? We love sharing our insight from the industry.